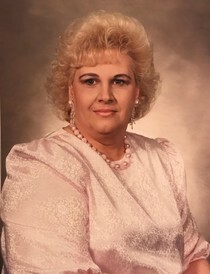 Geraldine “Gerri” Stone, 72 of Providence, went to be with the Lord on Saturday, November 10, 2018 at Baptist Health in Madisonville, Ky. Gerri was born in Providence on November 16, 1945, to the late Joe Walker and Lucy Conrad. She was a retired travel agent who loved seeing the world. Along with traveling, she had a love for flea markets, cooking, and family. She is preceded in death by her parents, Joe Walker & Lucy Conrad, her brother Larry Walker, her son Bobby Joe Stone, and her great grandson Braxton James Stanley. She is survived by her husband of 55years Bobby Stone, 2 Daughters; Robin Cramer of Providence & Tammy (Marty) Gibson of Clay, sister Diann Morse of Providence, brother Joe David Walker, 4 Grandchildren; Tara Young, BJ “Tank” Gibson, Amber Cramer, & Hallie Gibson, 4 great grandchildren; Kanden, Xane, Spencer, & Connor and many nieces and nephews. Visitation will be held in the Chapel of Jones Kirby Funeral Home on November 14, 2018 from 4pm to 8pm and on November 15 from 10am to 1pm with Bro. Ralph Alexander conducting the services at 1pm with burial to follow in Lakeview cemetery.